There comes a time when every man must make a choice when faced with the reality of joining the ranks of the undead or taking one’s chances with the survivors. Which will you choose? Set in post-apocalyptic looking Vegas, where zombies and humans have taken sides, it’s a turf war where only one party shall remain and reign supreme. Although players are asked to select sides at the very start of the game, this decision won’t change the base game, but makes all the difference in the bonus game. The best part about Lost Vegas is the thrill that it is to play. Every single character in the slot has his, or her, own unique effects, animations and sounds, making for an interesting and varied scenario each time. Boredom is not an option. Although players choose sides at the very start of the gameplay, this doesn’t mean that they can’t switch sides later in the game. In fact, it makes the game even more fun discovering all the various characters from both sides, as they all have their own individual roles. Not to mention the game is packed full of sick graphics and sound effects, a real treat to enjoy for all the senses. 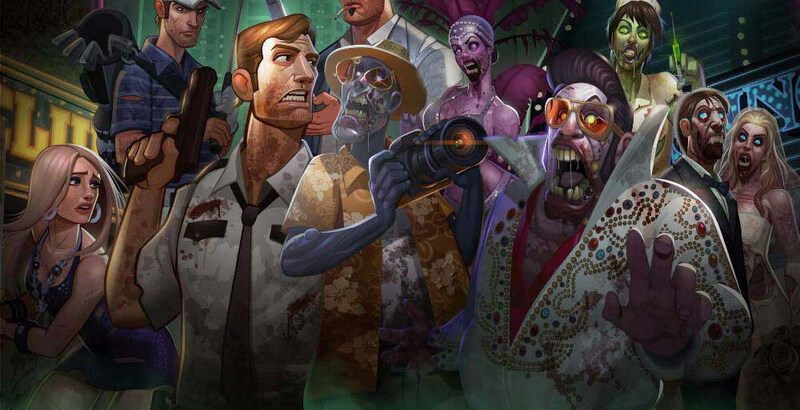 Lost Vegas is a 5 reel, 253 ways to win slot, set in a dark and dreary post zombie apocalypse Vegas. The two game play options are Survivor Mode and Zombie mode, which are activated after a non-winning spin. Either option features a different bonus game. Both games can be adapted to player preference in terms of activated paylines, coin and bet values, as well as free spin and max bet options. The game itself has some snazzy highlights. In Zombie mode, the first of these is its fistful of cash, which as the name implies, gives cash prizes. 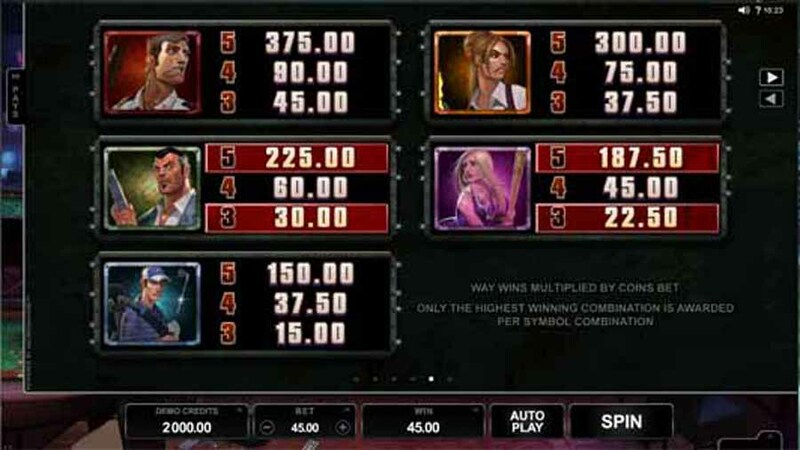 In survivor mode, on the other hand, there’s the blackout bonus feature in which the reels are scanned and the high paying symbols are shown; these in turn all give a cash prize. Additionally, for both features, any scatter symbol landing on the reels will trigger the free spins! Normally free spins are set off when 3 scatters, represented by a hazard symbol, are landed. Each spin is unique to the game mode. In the undead mode, players get what is called an infection, where the flesh-eating ghouls become stacked wilds that contaminate the reels they come in contact with, until the spins are exhausted. While this play mode involves a significant amount of risk, the payout potential is colossal, as a full set of expanded wilds translates to 2155x the max spin. Survivor mode is the safer bet for more cautious rollers. The stash feature in this mode involves a domino effect of cascading reels, where the lowest value symbols are replaced by new ones raining down from above. Each of the vanishing symbols in turn stacks up on the survivor meter and accumulates to a total prize which is awarded at the end of the spins. 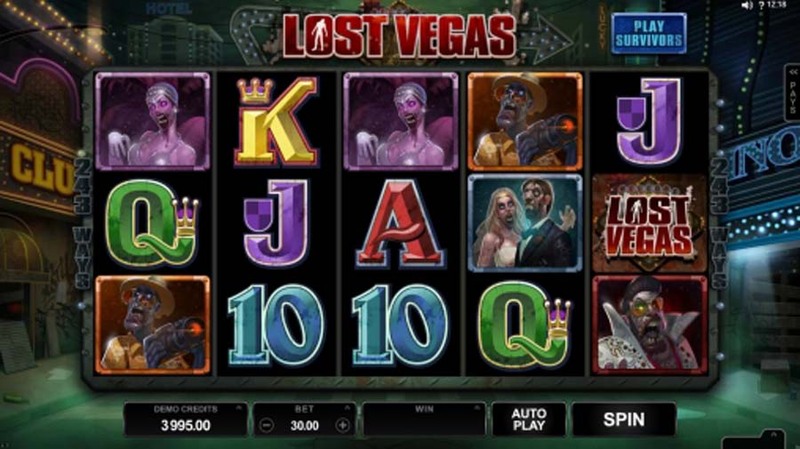 As with most Microgaming slots, Lost Vegas is also available on mobile devices.